The system should be “Top Feed”: Where water is added to the top of the coco and removed from the bottom. Bottom feed systems rely on wicking and can lead to problems with salt accumulation in coco. 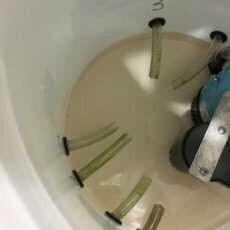 The system should be “Drain to Waste”: The Nutrient Element Ration (NER) of the nutrient solution will change and become suboptimal in a recirculating system. 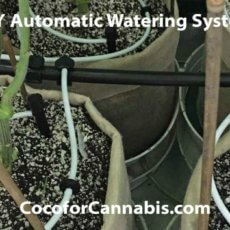 The main benefit that coco has over other hydroponic systems is that you can provide the perfect NER by providing fresh nutrient solution during each fertigation. Be sure to read our tutorial, “How to Dispose of Waste Water”. Flow Rate: You need some way to adjust the flow to individual plants. With the drippers that I use, this is done by twisting the heads of the bubblers. If your drippers are not adjustable, you will need barbed valves on each line to regulate flow. Duration of Events: Once the system is installed run it and wait for run-off. Run-off should appear from all pots at about the same time. Adjust flow to accomplish this. Note the time it took and establish fertigation event durations. My events are all 2 minutes long, which is about 1 quart per plant. All of the plants that you put on the system will get the same nutrient solution. You can revert to hand-watering to do flushes when needed. However, you want to be able to give the same nutrient solution to all of your plants at every stage of the grow. This means choosing strains which enjoy similar EC and which will mature through the flowering cycle on similar timelines. This article covers the two most common problems with automatic watering and how to avoid and manage them. First, water distribution problems with automatic watering systems often lead to EC burn (aka “nute” burn). Second, bacteria can colonize your reservoir and harm your plants. Water does not disperse well laterally in coco. If the water is not saturating the media, salts may accumulate in the drier regions and burn your plants. If water is not well distributed the EC of the run-off may remain low, even as the plants are burned from salt build up. Tip burn despite low run-off EC is indicative of a water distribution problem. There are many options for distributing water to the plants. You can run inline drippers and bubblers on a stake, or use halos or other devices designed to distribute the water. See my DIY Automatic Watering System Tutorial. The water pressure in most indoor drip systems is not as high as normal water pressure. The drip bubblers are designed for outdoor use on normal (full) water pressure. On their labels, there are pictures where it will look like they spray water around – but in most indoor systems, they will just leak. If they are adjustable, you will be able to control how fast they leak, but they will not really distribute the water. You need to distribute the water by adding at least four drippers per pot. These should be distributed equally around the surface of the media. 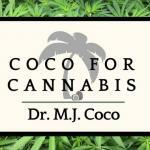 SM-90 is a surficant, and I recommend it in all coco grows. It is already included in the supplements listed in chapter 4. When using an automatic watering system SM-90 is critical not just as a surficant, but also as an antibacterial, as discussed below. If SM-90 is unavailable, a different surficant should be substituted. Surficants reduce the surface tension of water, which promotes distribution throughout the media. They will also help prevent dripper heads from clogging. Air-pots are an excellent choice for an automatic watering system. They are tall for their size which promotes the distribution of water through the media. Fabric pots are also available in “tall” versions and these are preferred. Avoid plastic pots or wide and short fabric pots as these create additional challenges with automatic watering. Regardless of the drippers, halos, or other distribution device that you are using, the distribution of water in a drip system is always less than perfect. Do your best and be sure to use at least four points of fertigation as I discuss above. SM-90 is also a surficant and will help distribute the water more effectively. However, you should still plan to hand-water at least once per week. This will act as a mini-flush that will remove salt build-up from areas that do not get much flow. Use a little more than the normal amount of water during this weekly hand-watering. As discussed below, you also need to clean out the reservoir once per week. There will be nutrient solution left in the reservoir when it comes time to clean out. Plan this so that there isn’t a lot! I save this nutrient solution and use it to hand-water the plants. It is still clean enough to feed the plants, but I don’t want to put it back in the clean reservoir, so it is the perfect option for hand-watering. This accomplishes two things: It uses up the nutrient solution and it helps water distribution. The primary concern when managing a reservoir is preventing an infestation of anaerobic bacteria. Following the practices below will allow you to prevent most issues with bad bacteria. Take daily samples from the Reservoir to measure both EC and pH. A bacterial infestation will cause pH to rise and EC to drop. If you notice this pattern in your reservoir, it is likely that you have a bacteria problem. If left alone, the reservoir will get slimy and start smelling like dead fish. Significantly, the growth of bacteria can be transferred to your plants where it can cause “root rot”. Monitoring EC and pH are the best ways to get an early read on these issues. Since pH can potentially drift out of range, it is also important for plant nutrition to keep tabs on the pH in your reservoir. You should adjust EC and pH issues to bring the reservoir back to your targets. But then look for the underlying issue. Ideally, the EC and pH in your reservoir should be stable. To prevent bacterial infection, it is important to use a couple of products that you may not have been using with hand watering. It is also important to keep your water oxygenated and this usually requires also keeping it cool. In addition to your normal nutrients, add H2O2 and SM-90. Hydrogen Peroxide (H2O2): The H2O2 that you need is not the stuff that you use for first aid. The first aid stuff is a 3% solution, whereas the horticulture stuff is a 29% solution. You need to use the 29% stuff. 2.5ml/gal. Add it last, just prior to adding to the reservoir. You need to have an air-stone, stirring pump, or electrolysis to provide O2 to the water. Oxygenating the water not only makes it difficult for harmful bacteria to grow, it is also great for your plants! It is easier to oxygenate water that is cooler. This is why many hydroponic growers use chillers for their reservoirs. However, a chiller is not needed unless you have a large reservoir (>20 gallon) supporting a large number of plants. 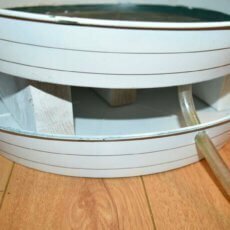 With smaller reservoirs, you can chill the reservoir the cheap and simple way. Simply freeze bottles of water and periodically drop them into your reservoir. This is a potential source of bacteria, so be aware of cross-contamination (keep your frozen water bottles clean). It doesn’t have to be light sealed, but the less light the better. Be sure to keep the lid on and keep the reservoir as dark as is practical. The reservoir should be completely drained and cleaned about once per week. I have had no problem going up to 9 days between reservoir clean-outs. The one time it went to 10 days, I saw that problems were starting! For up to a week, you can simply top-off the reservoir with fresh nutrient solution. Always measure both the EC and the pH in the reservoir before adding top-off water. Top-off water should be calibrated to bring the reservoir back to your EC and pH targets. Once per week you should drain and clean the reservoir and pump. Use H2O2 also to clean out the reservoir. Be careful, it will burn your hands. Use gloves! 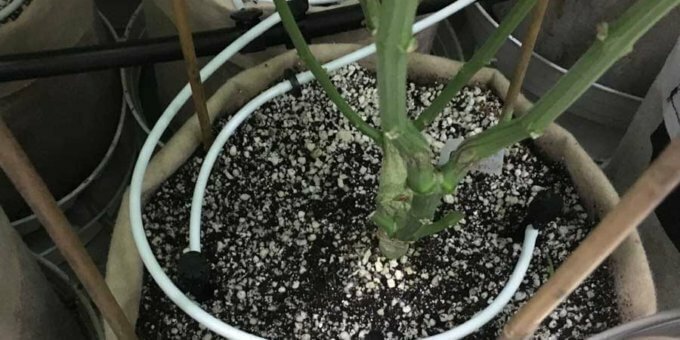 To know how often and when you should run your drip system, read our tutorial, “How to Water Cannabis in Coco”. When you say a soak them in a diluted solution of h2o2, do you mean half h2o2 and half water or more diluted? Stronger is better, but you have to dilute it somewhat. 29% is really strong. I do not have a specific recipe – but it should be bubbling and fizzing pretty well. If it is too strong it will burn your skin, so wear gloves.